The actor Michael Sheard, who has died of cancer aged 65, will be remembered by younger viewers as the abrasive and terrifying Latin teacher Maurice Bronson from the TV series Grange Hill, which was set in a London comprehensive. His stern countenance, barked orders and ill-fitting toupee made him a television icon in the programme between 1985 and 1989. Born in Aberdeen, the son of a minister, he performed in school productions, having caught the acting bug in 1950 after seeing the prisoner of war escape movie The Wooden Horse. He did his national service in the Royal Air Force and graduated from the Royal Academy of Dramatic Art having won the Tennant's Contract for all-round ability. His early professional work took in repertory theatre in Perth, Carlisle and Bromley, but he quickly turned his back on the theatre for a sustained and varied career in films and television. His first TV appearance was in Suspense in 1962. He was to play the first of 13 roles in Dixon of Dock Green in 1963. His first appearances in two other police series, Z-Cars and Softly Softly, were in 1968 - accompanied by another Dixon of Dock Green part. Sheard worked voraciously, had no delusions of grandeur and relished being part of a profession he loved. He featured in many other popular shows including Van der Valk, The Darling Buds of May, Blake's 7, The Troubleshooters, On the Buses and The Professionals. He had stints in both Crossroads and Take the High Road. Then there was Dr Who. He was proud to be one of that series' most prolific visiting actors, appearing alongside five Doctors in six stories between 1966 and 1988. His final association with the series is a studied performance opposite Paul McGann in an audio adventure to be broadcast on BBC7 shortly. Other memorable TV appearances included Preston in Stephen Poliakoff's Caught on a Train (1980), the harsh building site boss Herr Grunwald in Auf Wiedersehen Pet (1983-84), the Reverend Bunting in The Invisible Man (1984) and Emily Bishop's suitor Arthur Dabner in Coronation Street (1989). Casting directors were keen to use this dependable, versatile and thoroughly professional actor known to many in the business as "One Take Mike". Though often cast as German bad guys, he notched up over 40 film credits, including The Mackenzie Break (his debut in 1970), Force Ten from Navarone (1976), The Riddle of the Sands (1979), All Quiet on the Western Front (1979), Escape to Athena (1979, his favourite, appearing with his great friend Roger Moore) and High Road to China (1985). He had a speciality in Teutonic villains, playing Hitler on screen a record five times: on TV in Rogue Male (1976), The Tomorrow People (1978), The Dirty Dozen: The Next Mission (1985) and Hitler of the Andes (2003). The most famous though, was on the big screen: a scene-stealing cameo signing an autograph for Harrison Ford in Indiana Jones and the Last Crusade (1989). He was also cast three times as Heinrich Himmler, although adding the role of Hermann Goering to his list in the TV comedy 'Allo 'Allo (1992) was one of his few regrets and a rare unhappy engagement. He was delighted when George Lucas cited his demise, choked to death as Admiral Ozzel by the menacing stare of Darth Vader in The Empire Strikes Back (1980), as his favourite ever movie death scene. He embraced the cult status that Mr Bronson, and his brushes with science fiction gave him, appearing at conventions with gusto. Sheard was, in reality, a convivial and friendly man who was popular on set, earning the gratitude of the younger Grange Hill actors by demanding that the children were treated no differently from the adults. He found the word "fan" pejorative, referring instead to his aficionados as "appreciators", eschewing backstage hospitality to mingle and chat affably, remembering faces, establishing genuine friendships, and waiving remuneration to appear at charitable events. He treated everyone the same, reserving scorn only for lofty actors who treated extras or the public with disdain. Such was his popularity that the first volume of his autobiography, Yes, Mr Bronson: Memoirs of a Bum Actor (1997), quickly sold out and spawned a further three volumes. He married Ros, his "Dearly Beloved", in 1961. She, and their three children, survive him. APA 6th ed. : Hadoke, Toby (2005-09-13). 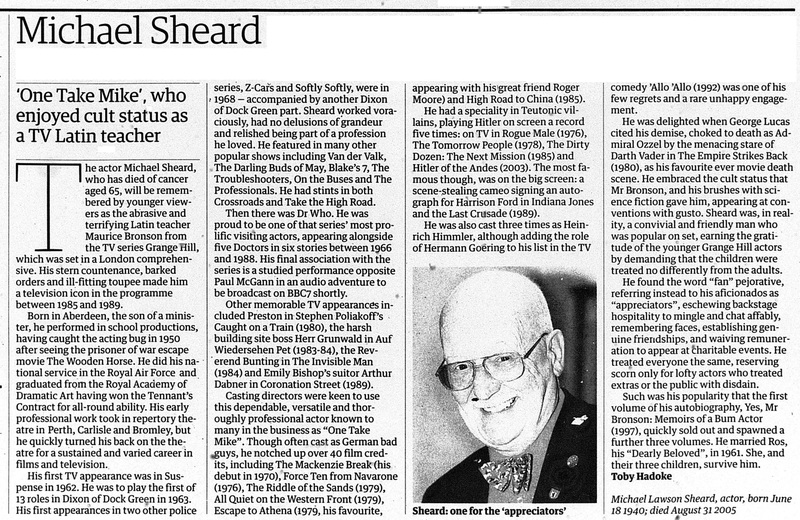 Michael Sheard obituary. The Guardian p. 32. MLA 7th ed. : Hadoke, Toby. "Michael Sheard obituary." The Guardian [add city] 2005-09-13, 32. Print. Turabian: Hadoke, Toby. "Michael Sheard obituary." The Guardian, 2005-09-13, section, 32 edition. This page was last modified on 5 June 2015, at 02:11.